Our books and training products are listed below. Contact us if you have questions about any products, want to order products off-line, or would like a quantity discount quote. Measuring and improving health care performance is more important than ever before. 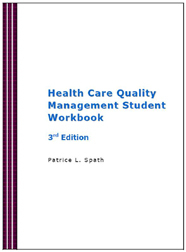 The 4th edition of this well-known learning resource by Patrice L. Spath covers the core principles and practices of quality management. All chapters have been updated with new material covering e-measures, data analytics, use of reliability science principles for process improvement, and much more. Click Here to view the Table of Contents. 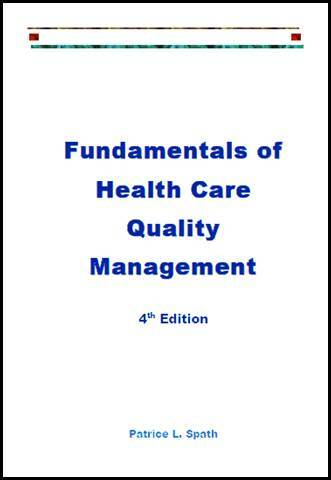 Students and novice quality management professionals will find Fundamentals of Health Care Quality Management easy to understand with lots of real-life examples showing how the principles are applied in all types of health care settings. 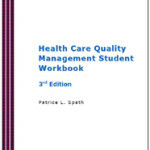 The student workbook, by Patrice L. Spath, contains 50 structured projects that complement the learning in Fundamentals of Health Care Quality Management. The projects are self-contained so they can be used for training in any quality management education program. Some projects are accompanied by answer sheets or data files that can be downloaded from the Brown-Spath & Associates' website. Click Here to view the Table of Contents. The projects are designed to provide students with experiences similar to what healthcare quality and patient safety professionals do every day. Developed by Patrice L. Spath, this training toolkit contains all the resources you need to educate physicians, staff, project teams, and students in the use of failure mode and effects analysis (FMEA). The toolkit includes a customizable powerpoint, reproducible handouts, extensive instructor notes and detailed trainer guide, several group exercises and sample completed FMEA projects. Click Here to view excerpts from the training guide and lecture. You'll received a CD containing the complete training toolkit. This book is full of tools and techniques you can immediately put to use in facilitating improvement projects in your organization. Written by experienced quality professionals, Duke Rohe & Patrice L. Spath, this book is full of field-tested interventions to help you accelerate improvement initiatives, manage project teams, and achieve positive performance changes. You'll find just the right tools for tackling quality and patient safety problems. 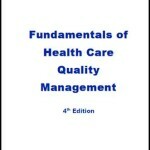 Click Here to view Table of Contents. In this book you'll learn how to incorporate comparative measurement data into your organization's quality and patient safety improvement strategies. Written by Patrice L. Spath & Aggie Stewart. How to choose credible data sources and how to dig deeper into causes of performance variation are just some of the topics covered. Click Here to view the Table of Contents. This book is the perfect tool for teaching health care professionals the fundamentals of patient safety improvement. A powerpoint presentation based on the book is available for free on the Brown-Spath & Associates' website. This small, but comprehensive resource, will be used long after educational sessions have ended. Click Here to view the Table of Contents. Quantity pricing available - call for details. Written by Patrice L. Spath, this book provides step-by-step instructions for designing and implementing a proactive patient safety improvement program in your organization. Topics include: measuring elements of patient safety, identifying error-producing factors, and making process changes to reduce the likelihood of mistakes. Click Here to view the Table of Contents. This comprehensive resource, by Patrice L. Spath, contains detailed information on how to design and implement and measurement and improvement strategy in case management services. The techniques are applicable in any health care provider organization or health plan. Click Here to view Table of Contents. In this book by noted patient safety expert, Patrice L. Spath, you'll learn how to conduct a thorough root cause analysis of a sentinel or adverse event and how to error-proof high risk health care processes. Click Here to view the Table of Contents.